In technology-driven societies, scientists, and educators alike flounder in making science interesting and applicable. Communicating science, defined as communicating scientific facts as well as teaching and using the scientific process, can also be done informally though leisure activities. In this qualitative study, I examined the leisure activity of aquarium keeping and its ability to communicate relative aquatic facts and processes. This study examined aquarium keepers across the United States via interviews, participant observation, and an ongoing analysis of aquarium hobby literature. Thus, this study indicates (1) caring for a home aquarium communicates science latently, (2) over time, latent science communication becomes activated, and (3) long-term aquarium keeping leads to a personal response in science, as well as conservation. In addition, artistic expression and innovation intersect with scientific knowledge and application to create beautiful, biodiverse, ecosystems. Through the process of successfully maintaining an aquarium, continued participation leads to a proficiency in applicable scientific facts, a better understanding of scientific processes, and an improved conservation ethic for aquatic resources. Further, this intersectionality motivates participation by providing new challenges and various forms of satisfaction. The human dimensions of the aquarium hobby and the values of aquarists are important to understand for many purposes, most notably because it encompasses an enormous sample of the American population and is extremely lucrative to those along most of the supply chain. Aquarium keeping is not only a hobby, but because of the relationship between science and art, it can communicate, as well as spark conservation efforts in serious aquarists. To communicate science, including conservation science, one must elicit a personal response toward science (Burns et al., 2003). A “personal response” includes an awareness, enjoyment, interest, opinion forming experiences, and understanding. These outcomes can be achieved through means defined as formal (e.g., school) or informal (e.g., citizen science; Dickinson and Bonney, 2012). Informal scientific communication includes passive means, often bordering on entertainment. This line, between scientific communication and scientific entertainment, is dense with diverse recreation and leisure activities. One such activity is the hobby of home aquarium keeping. Aquarium keeping is a global industry worth between 15 and 30 billion U.S. dollars (Hoff, 1996; Wood, 2001; Cato and Brown, 2003; Tlusty et al., 2013). In 2017 there were 12.5 million U.S. households keeping freshwater aquaria and 2.5 million keeping saltwater (American Pet Products Association, 2017) encompassing 139.3 million individual freshwater, 18.8 million saltwater organisms, and approximately 10% of the American population (American Pet Products Association, 2017). Because of these participation levels, home aquaria has huge outreach potential. It is important to understand the past, current, and future effects of the hobby on the aquarists who keep these systems. Through interviews, content analyses, and participant observation, I found a modern and historical link between art and science in aquarium keepers. Further, this link seems stable, with the aesthetic value of aquatic organisms as one of the key motivators for hobby participation. In addition, the process of keeping a successful aquarium exposes the aquarium keeper to a vast array of scientific information, principles, processes, and methods. I argue the keeping of an aquarium may be motivated, and that motivation maintained, through an aesthetic interest, but the side effect of aquarium keeping is a personal response toward aquatic organisms. Results indicate this response affects scientific and conservation awareness, enjoyment, interest, opinion forming experiences, and understanding. This study indicates an aquarium helps link aquarists to an increasingly damaged aquatic world. Home aquarium keeping is an unlikely source of scientific communication due to its highly consumptive past and, to an extent, present. This consumption not only includes the removal of live aquarium specimens for the aquarium hobby, but also encompasses other related practices that detrimentally affect their populations and habitats. This includes the collection of live plants and coral, invertebrates such as shrimp and crabs, as well as abiotic structure (e.g., “live rock”). Additionally, the aquarium industry is historically tied to the curio trade (Wood, 2001; Rhyne et al., 2009; Townsend, 2011; Dee et al., 2014; Fujita et al., 2014), likely exacerbating the negative connotation surrounding the hobby. A vast array of literature exists on the aquarium hobby, eliciting over 8,000 Google Scholar hits; however, it is primarily focused on understanding the aquarium industry's effects on the environment at both ends of its supply chain. For example, there are numerous studies on the impacts of removing aquatic organisms from the wild (Parks et al., 2003; Jones et al., 2008), the impacts of aquaculture (Tlusty, 2002; Parks et al., 2003; Rhyne and Tlusty, 2012; Bush and Marschke, 2017; Duggan and Pullan, 2017; Lorenzen et al., 2017), and the capture and care of organisms (Wood, 2001; Jones et al., 2008; Bell et al., 2009; Militz et al., 2016). Once ornamental organisms are collected other factors are studied. This includes diseases associated with aquatic organisms (Whittington and Chong, 2007; Lawson et al., 2015), invasive species release (Padilla and Williams, 2004; Delaney et al., 2008; Howeth et al., 2016; Bandaranayake and Chandrasekara, 2017; Magalhães et al., 2017; Selwyn et al., 2017; Tuckett et al., 2017) and use for popular aquarium species for breeding and scientific research (Hoff, 1996; Moe, 2003; Moorhead and Zeng, 2010; Olivotto et al., 2011; Domínguez and Botella, 2014; Tehrani et al., 2014). Another, far less common focus for research includes the human dimensions of the aquarium trade and hobby. Instead of studying the organisms, the stakeholders are analyzed. Here, the aquarium hobby literature is increasing (e.g., Maceda-Veiga et al., 2014), but generally overlooks the aquarium hobbyist as a population of research interest. A captive ecosystem is a malleable canvas reliant upon science. James Shirley Hibberd, a nineteenth century part-time naturalist, documented the link between aquaria, art, and science in this quote: “The aquarium has become established as a triumph of art acting as the handmaid of science” Hibberd (1860). This link between art and science is evident in modern successful aquarium keeping; beautiful and creative ecosystems are created with a detailed understanding of the science working behind the scenes (Figure 1). Figure 1. A challenging and unconventional miniature 1.5-gallon reef aquarium can be grown in a glass vase. Home aquaria offers the home aquarist a chance to get close to oceanic organisms, appreciate their natural beauty, and even propagate them for sale and trade. Photo reproduced with the permission of the copyright holder [Matt Pederson]. Behind the scenes, scientific facts, processes, and methods are slowly learned and mastered. For example, the goal of every aquarist is to keep aquatic organisms alive in captivity. Arguably, the major hurdle for all new aquarists is applying their knowledge of the nitrogen cycle (Paletta, 2002; Delbeek and Sprung, 2005; Fenner, 2008). During the nitrogen cycle, a new aquatic ecosystems must be “cycled.” During this time, aquarists test their scientific knowledge, and patience, by monitoring the water chemistry and nutrient input as their “beneficial bacteria colonizes.” Then, once this occurs, they can slowly add new organisms to their system (Paletta, 2002; Delbeek and Sprung, 2005; Fenner, 2008). Aquariums allow non-scientific people a place to observe aquatic organisms, and master relative scientific facts and ecological processes via a hands-on learning experience. Aquaria have long acted as both formal and informal modes of educating the public; “Nor is it only for amusement that such parlor oceans [home aquaria] and lakes [ponds] are prepared and stocked; they are invaluable as a means of instruction” (Sowerby, 1857). Aquaria used as instructive devices are found in schools today (Rutherford, 2015a,b; Quality Marine, 2017). The link between science and aquarium care is not lost on teachers who aim to please students who ask, “When will I ever need to know or use scientific facts and knowledge?” Formal instruction with an aquarium communicates science, while informal learning through home aquarium care elicits a more personal response due to taking responsibility for those organisms. Science communication suffers from several issues, with one being a failure to go where the people are, not where they want them to be. For example, instead of studying how to get more participants into places of science communication (e.g., museums), I suggest we go to participants at their hobbies to explore the informal educational potential of those activities. Previous research has shown hobbies act as early careers, with a potential to lead to professionalism (Stebbins, 1979, 1980, 1992). In his extensive body of work, Stebbins explores the different participation levels within hobbies (i.e., amateur, professional), focused on describing the different types of leisure (e.g., serious leisure; Stebbins, 1979, 1982). Results indicate an additional leisure type, science as leisure, where science and conservation may be communicated thorough leisure activities. Previous personal experience in aquarium keeping, from 2000 to 2015, indicated an emergent theory linking aquarium keeping and science communication. In fact, I attribute obtaining my Master's Degree in fish phylogenetics to my past history as an aquarium keeper (Marchio, 2015). More specifically, I chose ethnographic methodologies to immerse myself in the social context of the aquarium hobby (Glaser and Strauss, 1967; Spradley, 1980; Agar, 1996; Charmaz, 2006). This method allows aquarists to help me interpret situations and events. By contextualizing the topic, I can further explore the importance of science to aquarium keeping as a sensitizing concept (Bowen, 2006). The framework for this study draws from previous experience, participant observation, semi-structured interviews, and analyses of aquarium hobby content. Due to the lack of hobbyist-specific peer-reviewed research, grounded theory allowed me to discover and explore the interconnectivity between leisure and science. Previous experience and participant observations were keys to this study. While many interviewees were open and willing to talk about the hobby, participants spoke more candidly outside a formal setting and much of the data comes from informal conversations. For example, at a “frag swap” I participated by shopping and “swapping” live coral fragments alongside other aquarists. There, I could be a “professional stranger” (Agar, 1996), listening to aquarists ask questions and comment on things important to them. Moreover, I attended the Marine Aquarium Conference of North America (MACNA) over 3 years (2015–2017) where a large vendor and conference room let me blend in and participate authentically. Additionally, participant observation helped to triangulate the emergent data and themes (Spradley, 1980). This consisted of maintaining both salt- and freshwater aquaria in my own home. I documented the majority of my experience in a notebook. The notebook consisted mostly of water quality measurements and observations of the inhabitants and the system. Both systems were set up for at least 1 year. To triangulate these data, I conducted twelve interviews. The interview protocol was semi-structured, providing a guide for the conversation. This allowed participants to go toward the most important topics to them, allowing emergence of theory. I carried out interviews in accordance with the recommendations of the Texas A&M University Institutional Review Board with informed verbal consent from all subjects. Aquarists interviewed were mainly saltwater aquarium keepers but some kept both saltwater and freshwater aquaria concurrently. A few maintained only freshwater at the time of the interview. It is important to note aquarium keepers often switch styles of involvement but usually begin their hobby with a freshwater bowl or aquarium. I choose interviewees that represented different stages of participation—from novice to advanced. In the leisure sciences, studies have shown there are different stages and styles of involvement in a leisure activity, and these can reflect different values, motivations, and experiences (Bryan, 1977, 1979; Chipman, 1986; Chipman and Helfrich, 1988; Scott et al., 1999; Scott and Shafer, 2001; Waight and Bath, 2014). Aquarium keeping seems no different. Novice aquarists were challenging to interview; they felt they had little information to offer which often lead to a decline for a conversation. Serious aquarists were the opposite. To supplement, online forum data were easy to obtain with new aquarium keepers seeming most comfortable talking behind a computer screen. Additionally, this study includes content from online forums, aquarium books and literature, and content of several aquarium conferences. Online forums included www.reefcentral.com and www.nano-reef.com. In addition, personal correspondence with aquarists online allowed for constant comparison and on-demand participant validation (Bowen, 2006). This is important since my previous experience could bias analyses (Agar, 1996). Additionally, I was able to connect with several important people, or “gatekeepers,” in the hobby. This includes two editors of major aquarium magazines, speakers at the national MACNA, speakers at freshwater aquarium club meetings, professional researchers in aquaculture, scientists from the California Academy of Sciences, aquarium club members across the United States, aquarium technicians and local fish store, or “LFS,” workers, as well as other leaders in the hobby. Using these connections, I made a network of individuals that I ask to comment on my conclusions of the hobby. Online discussions aided in receiving critical reviews. Lastly, the results below follow an internal documentation system used to describe the data. Data from participant observation and content analyses are “Field notes” while interview quotations have a pseudonym attributed. Terms italicized throughout are community-applied terminology (Ritchie et al., 2014, p. 193). The Texas A&M University Institutional Review Board, IRB2017-0405 D, approved all protocol. All interview data and contact information are stored in accordance with the IRB protocol. In this study, I discovered caring for a home aquarium (1) is largely motivated by aesthetic reasons, but (2) communicates science latently, over time, (3) and long-term aquarium keeping leads to a personal response in science, as well as conservation. Reviewed below, these findings are first situated within the context of the hobby—one that relies heavily on aesthetics. “I'm most interested in movement” (Leslie, Less than one year in the hobby). “The colors and growth of each coral is what has flourished my love for them.” (TOTM Feb 2010). “When setting up the tank, I was more concerned with color than growth. My experience showed me that corals will grow with patience, but selecting a few choice corals and placing them in optimal places really can make a difference.” (TOTM Feb 2010). These data reflect the aesthetic values involved in aquarium keeping; they also connote scientific communication. For example, different colored fish and invertebrates usually belonging to different species. Essentially, the new aquarist is most interested in biodiversity, reflected in words such as “variety,” “endless variations” sometimes specifying this as “color,” “shape,” “movement,” or “pattern”. One of the hardest things for new aquarists is identification of species and compatibility within and across species. Similarly, this includes behavior and growth. By focusing on an individual organism's attributes, a non-scientific aquarist is introduced to scientific concepts such as “species” and “biodiversity.” In fact, driven to increase various forms of color and movement, many aquarists unwittingly strive to keep a biodiverse tank. Further, within the confines of a captive ecosystem there are stocking limitations and compatibility issues that push aquarists to obtain more information on each organism they keep. In the data above, science communication is informal and thus sensitive to the true motivations of the hobbyist—through aesthetics. Additionally, as time progresses, aquarists strive to keep challenging themselves and the sensitivity to aesthetics gives way to other motivation. For example, an aquarist may change from fresh- to saltwater or back again, follow a specific artistic style (e.g., Iwagumi aquascaping style, Dutch Synthetic Reefing, Jungle Style; Figure 2), engineer their ecosystem by bypassing all-in-one aquarium kits and doing it themselves (i.e., “DIY.”), or they may recreate a wild ecosystem in exacting detail (i.e., “biotope”). Increased attention is paid to the organisms as well as the “aquascape” (Figure 2; Amano, 1996; Veganbrian., 2012; Brenner, 2017). This further embeds non-science oriented aquarists to the biology and ecology of aquatic organisms and these organisms are not limited to fish. Figure 2. Houston's Hiep Hong's “Jungle Style” 54 gallon aquarium, Aqueous Reflection, placed 116th at the 2017 International Aquatic Plants Layout Contest (IAPLC) (Brenner, 2017). He used specific species and his knowledge of them to create a living piece of art. Photo reproduced with the permission of the copyright holder [Hiep Hong]. Aquarists also challenge themselves to replicate wild ecosystems in exacting detail, a system called a “biotope.” In a biotope, only organisms that are found together in the wild are housed together in the same captive system (Stawikowski, 1993). Creating a biotope requires a large amount of research to accurately replicate natural conditions and house the appropriate organisms and aquarium décor (Stawikowski, 1993). A rather general biotope, a “miniature reef,” is often set up to display the oceanic biotope, or a “slice of the ocean,” in their home (Figure 1; Pederson, 2018). Octopus are intriguing animals and aquarists appreciate them for their engrossing behavior, amazing ability to change color, shape, and movement, and their ephemeral nature. These attributes makes them one of the pinnacle species for the home aquarist and one that truly communicates to people who may not be as interested in aquarium fish, plants, or coral. Research on wildlife-oriented recreation (e.g., fishing) show participants may shift their focus from a consumption orientation to one that is conservation orientated toward the wildlife in which they interact (Bryan, 1977, 1979; Oh and Ditton, 2008; Oh et al., 2013). For example, in a study across all angler types, anglers were initially motivated to participate for the consumption of the organisms (i.e., the removal of them from the wild). As the participant continuously interacts with the environment and the organisms, a conservation ethic emerges. A personal response was elicited by continued participation in a leisure activity and lead to an increase in conservation orientation (Bryan, 1977, 1979; Oh and Ditton, 2008; Oh et al., 2013). According to Burns et al. personal significance of science and conservation facts is influenced by cultural, social, and political conditions in which they are produced and/or promoted (2003). Further, it is critical to involve all aquarists in scientific communication in order to contextualize and frame their interactions with the captive ecosystem and its inhabitants. Aquarium social groups, such as clubs and conferences, are ideal places to improve a science and conservation ethic. Due to aquarium keeping's massive participation levels and available biodiversity, some aquarists specialize in certain species. Specialization lead to the creation of species-specific clubs and societies within the hobby. Using money from club members and other donations, these clubs fund research on their species of interest. For example, the American Cichlid Association offers the Guy Jordan Research Fund ($600–1500), which specifically targets cichlid research. Other U.S. clubs have similar funds (Marine Aquarium Society of North America, 2016; American Cichlid Association, 2018; American Livebearer Association, 2018; Ohio Cichlid Association, 2018). Moreover, the Marine Aquarium Societies of North America has made it a point to incorporate science in their mission by offering publication funding for scientists (Dr. Junda Lin Memorial Fund), two $4,000 scholarships for undergraduate and graduate students, and a scientific poster presentation at their annual conference. Lastly, conservation is not only limited to species. Serious aquarists can become attached to the places their aquatic pet's live, or an ex-situ attachment to geographic place. This attachment motivates aquarists to take international trips to see, and potentially collect, organisms in their wild habitat. In conclusion, aquarium keeping has the potential to bond caregiver, organism, and wild ecosystem. Understanding the human dimensions of the aquarium hobby is increasingly important. Due to previous mismanagement (i.e., Hawai'i; Tissot and Hallacher, 2003) as well as lack of any management whatsoever (e.g., the Philippines and Indonesia; Lunn and Moreau, 2004) wild ornamental fisheries are under intense scrutiny. In 2017, the state of Hawai'i closed its marine ornamental aquarium collection (McAvoy, 2017) and Fiji followed suit directly after on December 28, 2017 (Lacanivalu, 2018). Closing the aquarium trade to wild collection of organisms may be dutiful in the face of climate change; however, the positive short- and long-term effects of aquarium keeping on the home aquarist will be altered. Finally, this research indicates ichthyologists and natural scientists may be encouraged to study science and conservation through latent scientific activities such as aquarium keeping (Maceda-Veiga et al., 2014; Marchio, 2015). These results indicate aquarium keeping may offer people the ability to informally increase their science and conservation ethic in a way that is creative, challenging, and always changing. Conservation issues seem more prolific in the saltwater aquarium community. The freshwater hobby is overall less expensive, older, more specialized, and it is currently not as reliant on wild caught organisms as it was in the past. These attributes must have meaning since there are 10 million more freshwater aquarium keepers (American Pet Products Association, 2017) with a seemingly higher conservation ethic. Further, antecedents to participation in the hobby should be studied; for example, brand new aquarists may already interested in science and conservation. Future research is required to unpack these major points. In conclusion, it is important to understand the human dimensions of aquarium keepers across the United States, and globally, to continue understanding the human effect of home aquarium keeping. With 10% of the U.S. population already invested in keeping an aquarium, developing and facilitating scientific and conservation communication may aid in increasing a science and conservation ethic. Thank you to my dissertation committee and chair, Dr. David Scott, three reviewers, and my six amazing undergraduates who helped compile and decipher data: Eli Kain, Stephen Blair, Minna Wong, Madison McClintock, Aaron Drotts, Samantha Huntley, and Emily How. Lastly, I traveled to interviews and conferences for data collection via funding from the Department of Recreation, Park, and Tourism Sciences at Texas A&M University and was accepted with open arms by the aquarium community. 1. ^LPS is an antonym for Large Polyp Scleractinian coral species such as Acanthastrea and Favia species. 2. ^Softies is a term used for soft corals such as Sarcophyton and Lobophytum species. 3. ^SPS is an antonym for Small Polyp Scleractinian coral species such as Acropora and Montipora species. 4. 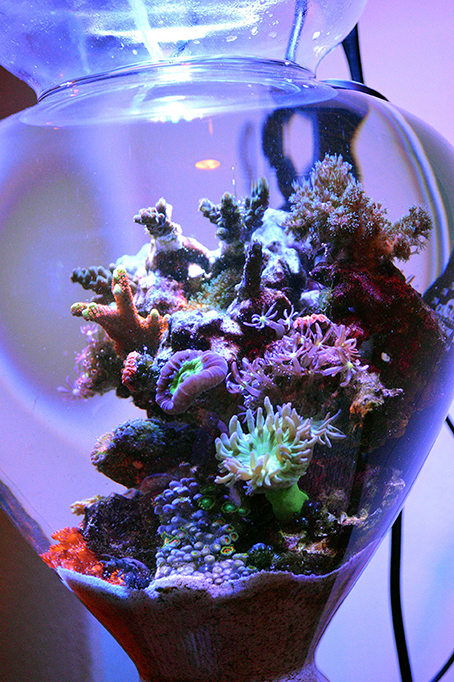 ^In 2006, Caribbean corals had limitations on take for the aquarium hobby. Agar, M. (1996). The Professional Stranger: An Informal Introduction to Ethnography 2nd Edn. San Diego, CA: Academic Press. Amano, T. (1996). Nature Aquarium World. Neptune City, NJ: T.F.H. Publications. American Cichlid Association (2018). Guy Jordan Research Fund. Available online at: http://cichlid.org (Accessed October 24, 2016). American Livebearer Association (2018). Vern-Parish-Fund. Available online at: http://www.livebearers.org (Accessed October 24, 2016). American Pet Products Association (2017). Pet Industry Market Size: Ownership Statistics. Stamford, CT.
Borneman, E. (2001). Aquarium Corals: Selection, Husbandry, and Natural History. Neptune City, NJ: Microcosm Ltd.
Brenner, W. A. (2017). 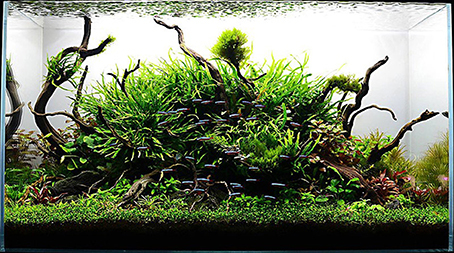 A Fish Tank Worth a Thousand Words: Hiep Hong's Award-Winning Aquascapes are Worthy of the Greatest Tanks. Austin, TX: The Austin Chronicle. Bryan, H. (1979). Conflict in the Great Outdoors: Towards Understanding and Managing for Diverse Sportsmen Preferences. Tuscaloosa, AL: University of Alabama Press. Bush, S. R., and Marschke, M. (2017). “Social and political ecology of fisheries and aquaculture in Southeast Asia,” in Handbook of Environment in Southeast Asia, ed P. Hirsch (London: Routledge), 224–238. Cato, J. C., and Brown, C. L. (2003). Marine Ornamental Species: Collection, Culture and Conservation. Ames, IA: Iowa State Press. Charmaz, K. (2006). Constructing Grounded Theory: A Practical Guide Through Qualitative Analyses. London: Sage Publications, Inc.
Chipman, B. D. (1986). Recreational Specialization as an Indicator of Attitudes and Management Preferences of Virginia River Anglers. Blacksburg, VA: Virginia Polytechnic Institute and State University. Delbeek, J. C., and Sprung, J. (2005). The Reef Aquarium, Vol. 3: Science, Art, and Technology. Miami Gardens, FL: Ricordea Publishing. Dickinson, J. L., and Bonney, R. (2012). Citizen Science: Public Participation in Environmental Research. Ithica, NY: Cornell University Press. Fenner, R. M. (2008). The Conscientious Marine Aquarist: A commonsense Handbook for Successful Saltwater Hobbyists 2nd Edn. Neptune City, NJ: T.F.H. Publications. Glaser, B. G., and Strauss, A. L. (1967). The Discovery of Grounded Theory: Strategies for Qualitative Research. New Brunswick, NJ: Aldine Transaction. Hibberd, J. S. (1860). The Book of the Aquarium. London: Groombridge and Sons. Hoff, F. H. (1996). Conditioning, Spawning and Rearing of Fish with Emphasis on Marine Clownfish. Dade City, FL: Aquaculture Consultants Inc.
Lacanivalu, L. (2018). Harvest, Export of Live Coral Now Banned. Sun (Fiji) News Limited. Lorenzen, K., Ainsworth, C., Baker, S., Barbieri, L., Camp, E., Dotson, J., et al. (2017). “Climate change impacts on florida's fisheries and aquaculture sectors and options for adaptation,” in Florida's Climate: Changes, Variations, & Impacts (Tallahassee, FL: Florida Climate Institute). Marine Aquarium Society of North America (2016). Student Scholarship Program. Available online at: http://masna.org/masna-programs/scholarship-program/ (Accessed October 24, 2016). McAvoy, A. (2017). Hawaii Stops Issuing Aquarium Fish Collection Permits. U.S. News and World Report. Moe, M. A. (2003). “Culture of marine ornamentals: for love, for money, and for science,” in Marine Ornamental Species : Collection, Culture and Conservation, eds J. C. Cato and C. L. Brown (Ames, IA: John Wiley & Sons), 423. Ohio Cichlid Association (2018). Jim Smith Fund. Available online at: http://www.ohiocichlid.com/jim-smith-fund/about-the-jim-smith-fund (Accessed October 24, 2016). Paletta, M. S. (2002). The New Marine Aquarium: STEP-by-STEP SETUP and Stocking Guide. Neptune City, NJ: T.F.H. Publications. Parks, J. E., Pomeroy, R. S., and Balboa, C. M. (2003). “Marine ornamental species: collection, culture and conservation,” in Marine Ornamental Species, eds J. C. Cato and C. L. Brown (Ames, IA: Blackwell Publishing Company), 183–206. Quality Marine (2017). Classroom Clowns. Available online at: https://www.reef2rainforest.com/2017/05/08/saddleback-clowns-bred-by-elementary-students-reach-aquarium-market/ (accessed January 11, 2018). Rhyne, A. L., and Tlusty, M. F. (2012). Trends in the marine aquarium trade: the influence of global economics and technology. Aquaculture 5, 99–102. Ritchie, J., Lewis, J., McNaughton Nicholls, C., and Ormston, R. (eds.). (2014). Qualitative Research Practice: A Guide for Social Science Students and Researchers, 2nd Edn. London: SAGE. Rutherford, B. (2015a). Reef Aquarium Keeping Helps Students Develop Scientific Skills. Shelburne, VT: Microcosm Publishing. Rutherford, B. (2015b). Tanks in Classrooms: Setting Up an Educational Aquarium. Shelburne, VT: Microcosm Publishing. Sowerby, G. B. (1857). Popular History of the Aquarium of Marine and Freshwater Animals and Plants. London: Lovell Reeve. Spradley, J. P. (1980). Participant Observation. Orlando, FL: Harcourt Brace College Publishers. Stawikowski, R. (1993). The Biotope Aquarium: An Authentic Imitation of Nature in Your Home. Neptune City, NJ: T.F.H. Publications. Stebbins, R. A. (1979). Amateurs : On the Margin between Work and Leisure. Beverly Hills, CA: Sage. Stebbins, R. A. (1992). Amateurs, Professionals and Serious Leisure. Buffalo, NY: McGill-Queen's University Press. Townsend, D. (2011). Sustainability, equity and welfare: a review of the tropical marine ornamental fish trade. SPC Live Reef Fish Inf. Bull. 20, 2–12. Tullock, J. H. (2001). Natural Reef Aquariums: Simplified Approaches to Creating Living Saltwater Microcosms. Neptune City, NJ: T.F.H. Publications. Veganbrian. (2012). Tips and Tricks on Creating Amazing Aquascapes. Available online at: http://www.reefcentral.com/forums/showthread.php?t=2217633andhighlight=art (Accessed October 30, 2017). Wood, E. (2001). Collection of Coral Reef Fish for Aquaria: Global Trade, Conservation Issues, and Management Strategies. Marine Conservation Society. Copyright © 2018 Marchio. This is an open-access article distributed under the terms of the Creative Commons Attribution License (CC BY). The use, distribution or reproduction in other forums is permitted, provided the original author(s) and the copyright owner are credited and that the original publication in this journal is cited, in accordance with accepted academic practice. No use, distribution or reproduction is permitted which does not comply with these terms.